Meanwhile; elsewhere on the web. I have had an image published by the online magazine, called Australian Policy online. It has been used using my creative commons licence, which I've always been an advocate of. APO is a news service and library specialising in Australian public policy reports and articles from academic research centres, think tanks, government and non-government organisations. As well as research, the site features opinion and commentary pieces, video, audio and web resources focused on the policy issues facing Australia. The image is used in an article entitled, Australia in the digital economy: the shift to the online environment, and can be read on their website, under the section Creative & Digital. I recently purchased two new books, while in Sydney. both wonderful tomes to sit and flip though, as I supervise practical sessions in the wet darkrooms and elsewhere. For those who are curious, here's a peek at my entire library of books for the last ten or so years, on librarything.com, I'm also reading a very engaging series of books, STUDYING PHOTOGRAPHY: A Survival Guide,"Your Assignment: Photography (Photo Developing)" (Douglas Holleley), and, "Photo-Editing and Presentation: A Guide to Image Editing and Presentation for Photographers and Visual Artists (Photo-Developing)" (Douglas, Ph.D. Holleley), again real refreshing insights into teaching Photography, not only the technical processes, but the creative and the organisation process as well, from creation to presentation. Standby for a flurry of input, as, now I'm toting an iPhone everywhere, and making images, constantly on the fly, with the ability to upload immediately if I so choose to flickr, my posterous account, the shared posterous project, or twitpic. My current favourite piece of software just got better, I'll report back when I find out what this stuff does and how it impacts on my ability to organise my life using Evernote! A new app has appeared, that enables chat and photo viewing at the same time. Photoflow, already does this, but the main difference is that Photoflow.com, is a website, and users to set up rooms based on groups they admin. Flickrapp on the other hand gives you instan feedback on your photos, and the chat is stiil a giant big 'chat'. Be interesting to see if this take off? A New Year; a New Change? 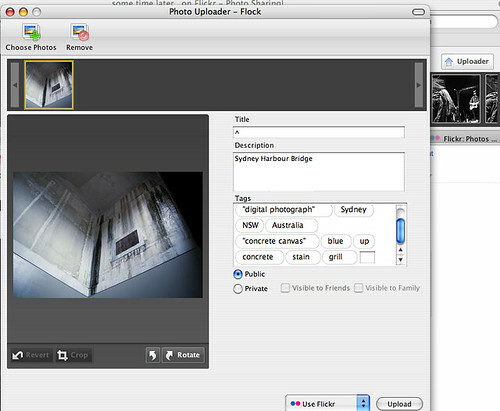 This is a screen grab from iView Media Pro, it shows I have 108 images from 2009, queued up for upload,to flickr. My 2008 file has 34 also awaiting upload to flickr. Making a total of 142 images. Based on a loose regime of 3 images uploaded a week I have 47 weeks worth of images to upload. This is only counting my phone-camera, there are a few from my Nikon Coolpix 3700 and my Vistaquest to upload as well. As I head into my 5th year of using flickr, looking back things have changed, changed dramatically. When I first started using flickr, I would upload almost daily, and spend innumerable hours connecting with all the other great people I'd 'meet'. Now, I have to remember to upload and some weeks it takes me so long to pick, which images to add, to keep the flow happening in my stream, I give up and leave it for a few days. Fortunately the altfotonet group still has some outstanding stuff, as does several others, where some cross posting occurs. Other changes to my online activity come from external sources like twitter and facebook. Now if I could just find a way to get paid for all my online activity? Unless you've been living under a rock of late, jpgmag.com announced it would be closing this week. This appears to have spurred a flurry of activity in the blogosphere, according to the a photoeditor blog. Plenty of opinions to boot as to why it folded. Personally I have no idea, other than perhaps the market can't handle an online and a print publication? The idea seemed great at the start from my perspective, but never sat that well with me, I wish it had continued, as I'm all for giving everyone a shot. In other news, [thanks to poodly on flickr, who writes junk for code]RMIT, has set up an online journal, called Second Nature, and is taking scholarly submissions, of text, no word on images yet? This service I signed up for some time ago, not really sure what it did, and upon revisiting last month I discovered it's like a giant feed off all your other web activities, like tumbler only more personal. Here's some boring stats from my flickr stats page. I wish there was an easy way to find all these images and add them to groups and add tags etc. Magenta has published it's latest magazine and offers sections for free download, an interesting if somewhat fence sitting approach to 21st century publishing. What I find interesting about this issue of the magazine, is the project by Jeff Harris. Jeff Harris documents his own life and uploads a few of the photos to his website, he finds interesting after processing and printing the film. He also allows people to leave journal entries for any given date in the last 5 years. Then he chooses the most interesting journal entires and matches them with the photos he took on those days. Harris may be chronicling his life but, unlike most bloggers, he reveals little about himself. We can’t even pinpoint his age or occupation with any degree of certainty, let alone his tastes and opinions. Often what he is pictured doing—hanging out with friends, napping, bookstore browsing, swimming—makes his life seem unexceptional (even if he was photographed with Kim Cattrall on November 15, 2005, and some photos were snapped by Bruce LaBruce, Martha Wainwright and Don McKellar). So, instead of learning about Jeff Harris, we start reflecting on times when we were happy or sad, and how millions of people feel these same emotions every day. We are reminded that truly memorable, life-altering events don’t happen often, and many people have much more difficult lives than ours. This project and several others, going on around the internet are the kinds of projects I could have only dreamed of in 1995 and am still excited about. The question remains though, is Western culture spending far too much time navel gazing, or to "borrow" from Roger Waters, "...is this species going to amuse itself to death?" It's interesting seeing how my images are used around the internet, the consumerist uses this image, in an article about Borders and plastic bags, another article about rock and roll and taxes used a graffiti image of Jim Morrison that I photographed, to decry the lack of 'attitude' to the tax department. All this thanks to bighugelabs.com's flickr dna page. A new feature has been introduced to the flickr experience, called places, it allows you to search for and find images of places around the globe. A new experience in online photography and chat is in beta stages. It's like flickr on crack! Blogger has just added a neat little slide show feature that allows you to run a slide show in the sidebar of your blog, all you need is an account with someone like flickr or paint-bucket or picassa, and away you go. Been Using Flock a fair bit of late, hats off to Lord Of The Flies over on flickr for prompting me to give it another go. This browser is very much geared towards to Web 2.0 and the social aspect of the internet. 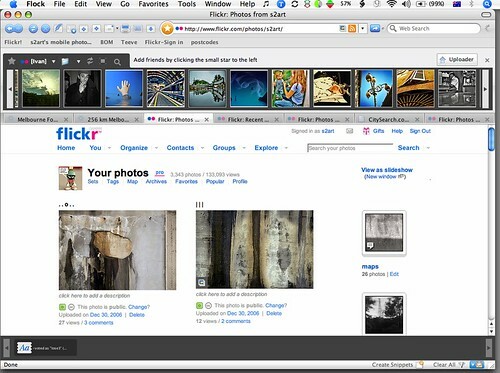 Flickr forms a major part in it's design and use, along with delicious, blogging and of course news feeds. Clicking on a small icon that appears in the bottom right corner of any photo on flickr allows you to launch that person's stream at the top of the browser window and then very quickly scroll across it to see what's new in thumbnail form. If something grabs you you can click on it to view the larger picture and entire page below. It has a built in photo-uploader, that allows quick and easy uploading directly from it's interface. 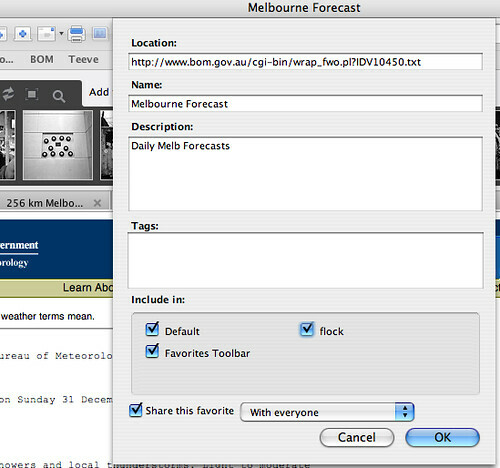 Tagging is real easy and adding to your own sets is an easy next step after adding a title description and tags. Another great feature is the snippets bar at the bottom of the screen, here you can store text and images for later use. Bookmarking has deli.cio.us built right in, this took me a little while to realise but was most likely due to my own ignorance more than poor design on flock's part. You can choose to share or not to share your bookmark/s as you work. All in all this browser is shaping up to be a good all-rounder. I wish however that the curser when clicked around on the screen didn't keep disappearing, and I have yet to test flock for colour fidelity.